Friday was a marathon day of book fair browsing. I started my day uptown at the NYC Book and Ephemera Fair, where I caught up with booksellers, several "Bright Young Booksellers" among them. I had the chance to meet Edmund Brumfitt, a London-based bookseller who was exhibiting on his own in New York for the first time (he was previously with Pickering & Chatto). He showed me a "pocket guide to physiognomy" c. 1805 that I found intriguing, primarily for its folding leaf of illustrations. (Considering my penchant for medical/surgical illustration, it was tempting, but more on that later.) 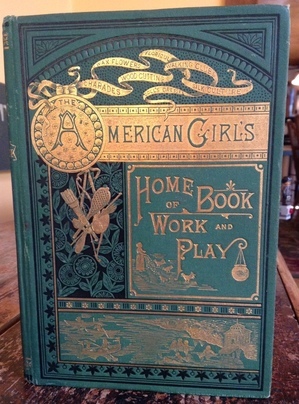 We did come away from this fair with one purchase, a gift for my daughters: American Girl's Home Book of Work and Play (1883), from John Liberati Books, where we struck gold last year with a serendipitous find. From there, I ventured to the New York Antiquarian Book Fair, where five or six hours of serious looking (and not-so-serious chatting) barely scratches the surface of what this fair has to offer. 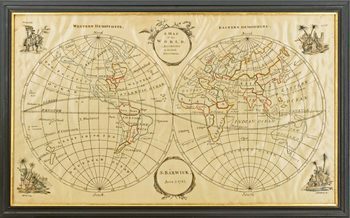 I was taken aback by a 1793 needlework map of the world, offered by Boston Rare Maps (pictured below). A large and beautiful world map executed in silk thread on satin, it is amazing to behold, perhaps even more so when one reads that it was made "almost certainly [by] an English girl of school age." Raptis Rare Books, which recently relocated to Palm Beach, Florida, showcased a wall of titles with an economic/political/timely bent, including the rare first edition of Asa Greene's The Perils of Pearl Street, Including a Taste of the Dangers of Wall Street (1834). Between the Covers Rare Books was offering a substantial and wow-inducing archive of children's book editor and author Charlotte Zolotow. I also enjoyed perusing their first edition of the unfamiliar (to me, anyway) dos-a-dos volume penned by Dorothy Parker (Men I'm Not Married To) and Franklin P. Adams (Women I'm Not Married To) and published in 1922. As always, vernacular art, photography, and agitprop--from Donald Trump to Harvey Milk--commanded attention in the vibrant booth shared by Brian Cassidy Bookseller and Lux Mentis Booksellers. And a trip to the fair would have been incomplete without a look at Seth Kaller's $2+ million Alexander Hamilton collection; more on that here. One of the gems at this fair, in my opinion, was a stunning fine binding of Butterflies and Moths (British) by Hannah Brown, offered by Bromer Booksellers (pictured above). 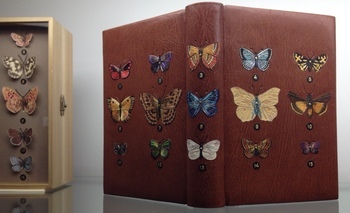 The full leather binding is embroidered over colored leather inlays with silk thread; brass "pins" inserted through the boards appear to hold each in place. Its custom wooden case is made to look like a specimen box. And ... two further purchases were made: a medical treatise on the eye from 1833 with a dazzling illustration and lovely contemporary marbled boards, from Jarndyce Booksellers; and the South African first edition of J. M. Coetzee's The Life & Times of Michael K (1983), one of my all-time favorite novels, from Jeff Bergman Books.